4.1 out of 5 based on 535 bloggers and 118 commenters. 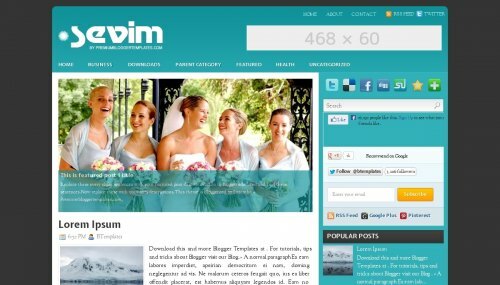 Sevim is a free blogger template adapted from WordPress with 2 columns, right sidebar, rounded corners, ads ready, slider, social bookmarking icons, posts thumbnails and drop down menu. What you have to be changed so that blue is not background , but green / brown . Really cool theme. I’ll love to use it. please i downloaded a template here but it failed to upload in my blooger. what do i need to do? Its a amazing template for every bolg. hwo to chamge those slide3s images and how to change the name of categories according to my category list? how to link my facebook page through those icon at upper right corner and also how to remove some icons? Thanks for sharing, it really works!